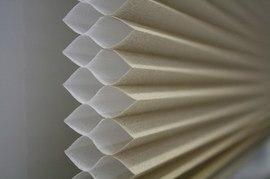 Cellular shades are available in a cordless variety, which is safer for children and pets because cords on shades can pose a strangulation hazard. Single cell shades are usually cheaper because they use less materials, but double cell shades are more energy efficient because they have two rows of cells to trap air and insulate the window. Cellular shades range between $40 and $220 per standard window.